Are You Maximizing the 5th Wall? If you’ve read this blog for any time at all, you know by now that I am obsessed with wallpaper. Obsessed. When you find the print/texture/color wallpaper that you love - putting it on the walls of a room then creates a room that you love! I’m now seeing the growing trend of installing wallpaper in unexpected places - places like your ceiling! Wallpapering the ceiling is economical, since it requires a fraction of the material that it would to cover all 4 walls. It is also so impactful - your eye is instantly drawn up to admire the beautiful pattern. Putting wallpaper on your ceiling is an amazing way to maximize the impact of your 5th wall. Painting accent walls typically evoke a strong opinion from designers - we either love them or hate them. But painting your ceiling an accent color, now that’s an idea I think we can all agree on! You’ve heard time and time again that painting is the most affordable and impactful way to change your space, but I think many people still want to stay safe with a neutral color on the main 4 walls of a room. 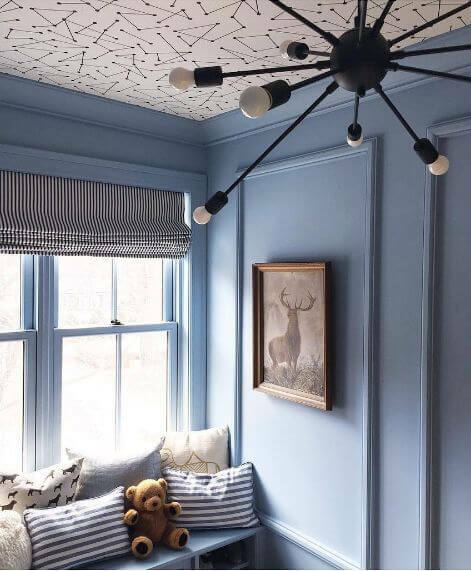 If you are living in the boring overly neutral zone, painting the ceiling of the room an accent color is an amazing option. I actually love when a bold colored ceiling is paired with simple neutral walls - it looks so chic. And this is not a serious or difficult commitment people - if you pick a strong color to paint your ceiling, and grow tired of it in 2 years - the cost/effort/time to repaint the ceiling is so minimal. But, I promise that a painted accent ceiling will impress your friends. These room photos prove my point! I think this tip is my favorite, because it is the most original! If you have low, flat, or boring ceilings, and the thought of wallpapering or painting them doesn’t float your boat - have you ever considered adding a ceiling medallion around your decorative light fixture? It is a relatively simple and affordable accent that can really elevate a boring ceiling into an architectural dream. 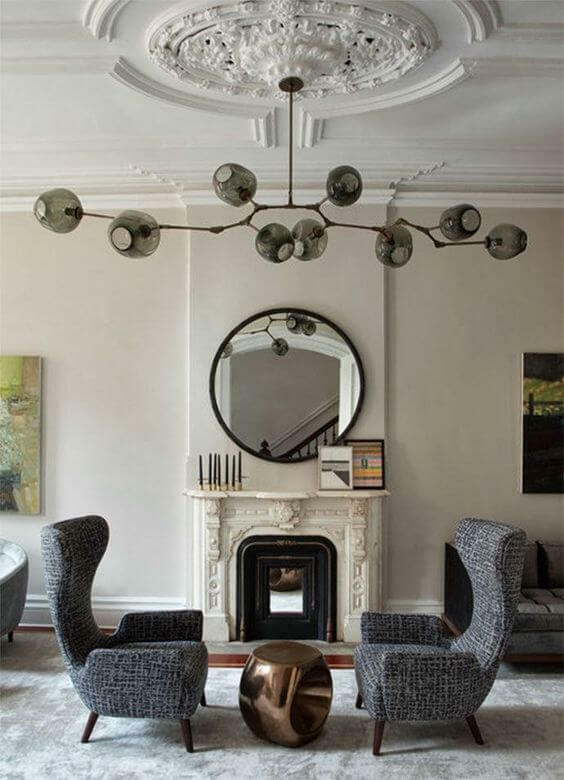 My favorite combination is when a sleek modern light fixture is paired with an ornate, traditional ceiling medallion. The eclectic look screams sophistication and makes the whole room look more expensive. 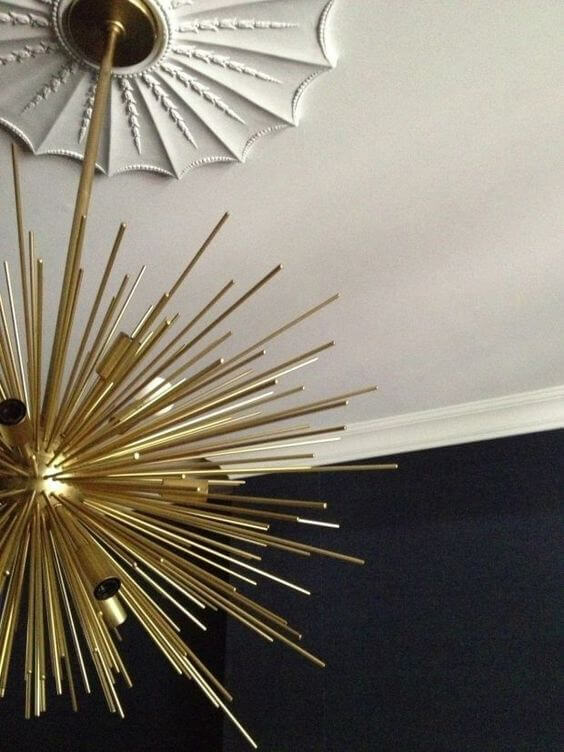 Do these 3 tips have your head spinning with ideas for your boring ceiling? All of these tips are practical and totally doable, either professionally or DIY. Would you try any of these tips in your home? Leave a comment below!